Our concert grand is a Steinway “Model D” in the Louis 16th style case, in light walnut. This particular model was never sold in large quantities, being only produced to special order. This piano was also never sold to concert halls. Our piano was built in Hamburg and sold in the 1902/3 season, and the six pianos of this style which were built at that time were all sold to stately homes (palaces?) in Europe. Steinway’s rules of client confidentiality will not allow them to tell us who was the original purchaser. The Sunderland Pianoforte Society began by borrowing and hiring pianos for its concerts. The Society managed to get hold of an old Bechstein, but in the late 1950’s the Committee decided that this old piano was not really suitable for the calibre of solo pianist they were now booking. They decided to look into the possibility of buying their own piano, and a busy fund-raising schedule was got under way. The old Bechstein could be sold and the money added to the purchase fund. Founder member of the Society, Ted Ducker, got help from the concert pianist Ronald Smith who helped to examine pianos in London showrooms and he played them to select an instrument that would be satisfactory for a society specialising in piano recitals. This was late in 1960, and the present piano was selected from the Steinway Showroom in London. The first pianist to give a recital on the newly purchased piano was, of course, Ronald Smith. The other players of that 1960/61 season were Ivan Moravec, Peter Element, Lisa Fuchsova, Paul Hamburger and Benno Moiseiwitsch. Since then the piano has been in concert use every season. Members and Committee began to notice sound problems in certain regions of the keyboard, and the pedal mechanism was becoming noisy. Thus, in 1996 it was decided that the instrument was seriously in need of refurbishment. The Secretary (Mrs. Lily Scott) made application to the “Foundation for Sports and the Arts” who made a grant to cover the cost of the work. A completely new action was brought from Messrs Steinway at Hamburg and Steinway technicians worked for fully three days in the Sunderland Art Gallery fitting the action and renewing the pedal mechanism, tuning, toning and balancing. During the rebuilding of the Sunderland Winter Gardens, when the Society was temporarily housed at the University using their piano in the Tom Cowie Hall, the piano suffered a serious accident: the single leg was broken in two places, the sounding board cracked ,the main cast iron frame was cracked and the outside case damaged in a fall onto concrete. 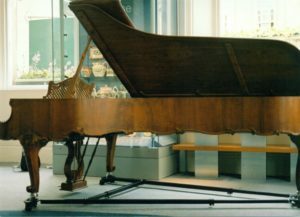 The repair was too big for their factory in London so Steinways took the piano away to Hamburg to their main workshop and completely rebuilt it with new sounding board, main frame and completely restrung. The outside walnut case was also refurbished. The bill for this was £17,600, so it was fortunate that our insurance company covered the loss for us. Steinways told us that when the piano was first sold in 1901 the rubber-faced casters were fitted so that no damage would be done when moving it on the “palace floor” (a palace in Europe), now you are to house the piano on a fully carpeted floor which will put too much drag on the legs. We thus were advised to have a specially designed A-frame trolley for the piano to move about on the fully-carpeted floor in the “Sunderland Pottery Room” of the new Museum and Wintergardens. This, again, was fitted by John Ross, Head of Technical Services of Steinway, Europe.